Formula Electric Belgium unites a group of motivated engineering students from different campuses of KU Leuven University and Thomas More University College in Flanders, Belgium. The team consists of 52 motivated students that work hard and passionately towards designing a winning car! Nova is the third car built by Formula Electric. It is the first four wheel driven car. It has a single piece monocoque, an adjustable suspension system. It has four in wheel motors, complete with an in-wheel gearbox surrounded by a 3D printed aluminum cooling jacket. The power comes from a modular battery system containing 9 independent modules. "May the downforce be with us!" NUMECA is very proud to be partner and sponsor of universities and high schools for projects like this one, enabling students to create state-of-the-art, innovative designs, supporting them with the tools they need to succeed. 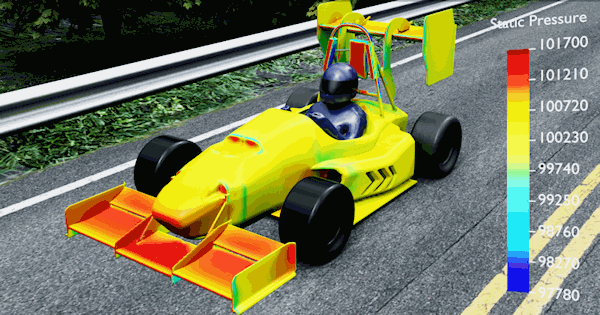 We also provide free student licenses for our simulation engineering tools, for more information have a look at our Academic section. Good luck Formula Electric Belgium! !